1.100% Brazilian Virgin Remy Hair, No Shedding, No Tangle, Can Be Dyed And Bleached. 3.The Medium Size Fits The Majority Of Woman's Head. Small And Large Sizes Can Be Customized. 4.With The Strictly Quality Controlled And Checked, We Guarantee The BEST Products as Possible. 6.100% RISK-FREE. Backed By a Unbeatable 30 Days Money Back Guarantee. ☑ Friendly and Fast Customer Service. 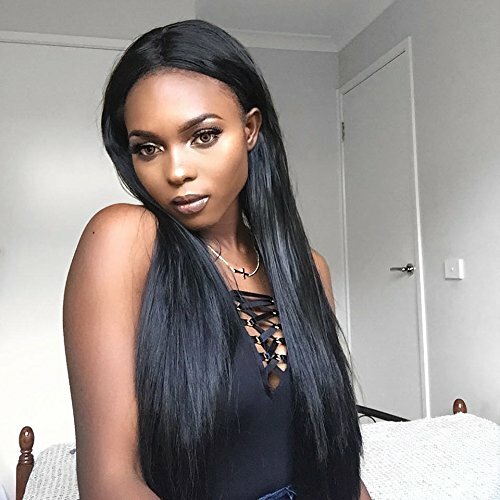 -100% HUMAN HAIR.This 360 Lace Frontal Human Hair Wigs with baby hair and natural hairline that looks like your own hair. Because it's all-match, it works almost everywhere. -TOP QUALITY. Best 100% Remy Brazilian Human Hair 360 Lace Frontal Wig and 150% density with baby hair. It's soft, healthy, odor-free, tangle-free, no shedding. Can be straightened, curled, bleached, dyed and styled as your own hair. It gives attractive looks and shiny image. -ADJUSTABLE. With elastic bands and three combs, you could adjust the wigs slightly. Medium Brown (in stock) Swiss lace , medium size(22.5" in stock) fits the majority of a woman's head. Small Size (21.75'') & Large Size (22.75'')&Dark Brown Lace & Light Brown should be customized. -WONDERFUL PRESENT. Soft smooth no shedding to touch and easy to comb.The wig from 100% odor-free and comes in a delicate box ready to become a present to anyone close to you that is and loves fashion or want to be beautiful. -KINDLY REMIND-The wig's color and the style in pictures might be little difference due to different monitor display, this is the Normal Situation, thanks for your understand. We offer EVERY customer a 30-days money back guarantee. The Wig can be returned, As long as it is in it's original condition including the excess lace in front and back uncut. If you have any questions about this product by Coco's Hair, contact us by completing and submitting the form below. If you are looking for a specif part number, please include it with your message.